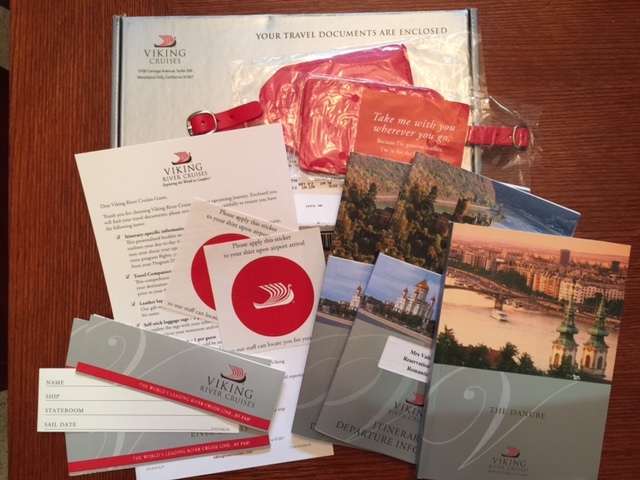 Our travel documents from Viking River Cruses arrived! I have had so many questions during this process. I am so happy I’ll finally have answers for some of the things I’ve been wondering about. I’ve been dreaming about taking a cruise down a European River ever since my friends, Jean and Walter posted photos on their Social media pages. We met this sweet couple while we took a guided tour of Israel several years ago. Jean and I became friends on Facebook while visiting Masada. How many people can make that statement? Our friends have taken several cruises with Viking over the years. Their photos were always so fabulous and they had obviously met more new friends along their travels. I signed up for Viking’s emails and catalogs because of them and their posts. I’d open the catalogs every time they landed in our mailbox, devouring the photos and dreaming of the ports the ships docked in. I have so many places on our bucket list that were so much more affordable that the Viking experience kept being pushed back down our list for another time. That is until one day in mid December when by chance I opened an email and there was an offer that I couldn’t refuse! Keep an eye out for a deal that you can’t refuse! Over the years there always seemed to be a 2 for 1 offer which still was expensive to me. I’d mention it to my husband and we would agree that it was just too much money. But this December day was different. They offered some of their best rooms including those with balconies for certain spring sailings for $2999 each and free air from NYC. Our flights from DFW would cost us $95 each. I called my husband and explained what a great deal this was and he gave the go ahead to book a trip! I chose the Romantic Danube cruise from Nuremberg to Budapest. We added a three day pre-cruise stay in Prague and the insurance. We later added two extra days at the end of the cruise in Budapest. We were going on a dream trip to four different countries! Ok, I’m a planner. I admit it. I’m one of those travelers that like to have every minute filled on a trip. When I book and plan our own vacations I write detailed itineraries and print them out for everyone to follow. I have control issues. I admit that too. This trip will be a little different. Viking has a lot of control. And the river, which I learned from research on Cruise Critic and TripAdvisor didn’t always cooperate. The water may be too high or too low which may result in long bus trips rather than smooth sailing along the blue Danube. Surely not in April! Right? Only time will tell. A bit about Viking’s free flight deal. It depends on what airport you want to fly out of. We chose DFW so we paid $95 each for the privilege. I seriously thought we might be taking a world tour of airports when I booked it! What a deal!!! I’ve booked all our previous overseas flights for over a thousand dollars or more out of Dallas. Too good to be true, right? I was really surprised when our flight information arrived in my inbox! All our flights are on Lufthansa. We have an overnight flight out of DFW to Frankfurt (an international hub) with a nice three and a half hour stay to clear customs and then we proceed on to Prague. Same thing when we fly out of Budapest. No long layovers but we do have a 6:30 AM return flight! Oh my gosh!!! Too early! But definitely worth loosing a little sleep for a great deal! Maybe we will be so tired that we will actually sleep on the plane back home. If you are flying Lufthansa and want assigned seats then you’ll need to set up a Lufthansa account online and choose seats once you get your PNR number in your final travel documents. I decided to choose our seats since I like sitting next to my husband. I like having a shoulder to try to nap against especially on long overseas flights. I kinda like him too. So, I ended up spending another $200 for assigned seats that cover all of our flights. Different prices on different placement of seats. If you want to travel not knowing if your travel companions will be seated next to you or not, then that’s fine. They will be assigned when you print your boarding passes. By the way, if you book your flights through Viking Air, your transfers are included. As my research continued, I noticed that Viking offered a Referral program. First time cruisers could receive a discount of $100 per person ($200 per cabin/couple) and all you have to do is give them a customer number and name of a person that has sailed with them before or have booked and paid for a cruise in full. The person who’s number you use also gets a credit that can be used on their next sailing. How cool is that!? Needless to say, I contacted my friends and got their info and called Viking. Their customer service was absolutely wonderful! I had such an amazing experience that I am willing to pass along my customer number to FRIENDS who would like to use it. Just email me and I’ll give you the information. Val110358@aol.com there may be restrictions due to the deal you chose, but it’s worth a try, isn’t it? A call to them or your travel agent. Why not? I hate to leave money on the table that can be used for an added excursion, an exceptional dinner of a fun souvenir. Remember though, the credit is given at their discretion according to their rules. Visit the Viking website to see a list of their rules. The posting here is for information only. Regensburg: Optional Weltenburg Abbey & the Danube Narrows excursion. If you take this tour you won’t be able to take the included tour of Regensburg as they both begin after breakfast. Weltenburg is one of the oldest monasteries in Germany. Its famous brewery has been crafting beer since 1050. You also board an excursion boat for a short cruise through the Danube Narrows. The booklet says that you return to your ship for lunch and then take a walking tour of Regensburg. Cost of the tour is 49€ each. Only offered through the end of October. Really hope it’s available on our spring cruise but really not sure due to the wording. We can hope. UPDATE!! We were able to take this excursion and the Abbey was nice to visit. Vienna: Optional Figaro’s Wedding performance. After dinner on the ship you are taken to an exclusive Viking performance of Mozart’s comic opera, Figaro’s Wedding. Music, costumes and a beautiful venue in Vienna, Austria… Why not?! I’m really looking forward to this one!! My hubby may not be as enthused. 74€ each. UPDATE! I went and though it was an enjoyable evening, in my opinion, it was very unprofessional. The performers were students, sets basically nonexistent set in a hall that was mearly a room with folding chairs. Book your own tickets at a real opera. Vienna: Optional Schonbrunn Palace tour. After lunch on our second day in Vienna, you may choose to visit Maria Theresa’s baroque palace including the formal gardens. 49€ each. Budapest: Optional Hungarian Horsemen: Lazar Equestrian Park. Horsemanship exhibition of the legendary Hungarian “cowboys”. After the show you can visit the stables and maybe take a carriage ride. 49€ each. Budapest: Optional Dohany Street Synagogue & Jewish Budapest (not offered on Saturday or Jewish holidays.) Learn about Budapest’s Jewish past and present while visiting the Great Synagogue (the largest in Europe), the Emmanuel Memorial, the Hungarian Jewish WWII Memorial and the stunning display of empty shoes along the Danube. 49€ each. UPDATE! The shoe memorial is a short walk from where Viking docks. Just walk along the shore of the Danube toward the Parliament and you can’t miss it. Very moving. What’s in Viking River Cruise travel documents? What’s included in the travel document mailing? 1. Itinerary and Departure Information booklet. Yay! One booklet for each of us. Our airline, hotels, transfers and pre and post cruise information. Includes day to day plans for our cruise including what we will be doing on all the included tours and this is where I got the optional tour informotion I shared with you. It’s in more detail though. Lots of other valuable info about all sorts of subjects. If you have a specific question ask me in the comments and I’ll check this little gem for ya. 2. Booklet all about the Danube River. Very informative little book. Get out the reading glasses! 3. Leather luggage tags. Red. One for each of us. 4. Paper luggage tags to help the Viking staff get your luggage to the proper stateroom and hotel rooms. 2 for each of us. 5. Big Red Viking stickers to put on your shirt at the airport so there staff can find you, cut you out of the crowd and herd you into their vehicles for transfer to the hotel if you’ve booked a pre-cruise extension. YeeHaa! 6. A nice little card welcoming us to the Viking family explaining what’s in the box. At the bottom it reminds us to ‘like’ their Facebook page to connect with our fellow travelers. And there it is. Back to social media. Connect with our fellow travelers. That’s what some of us have already done. That’s what I’m looking forward to the most. ***Remember…. 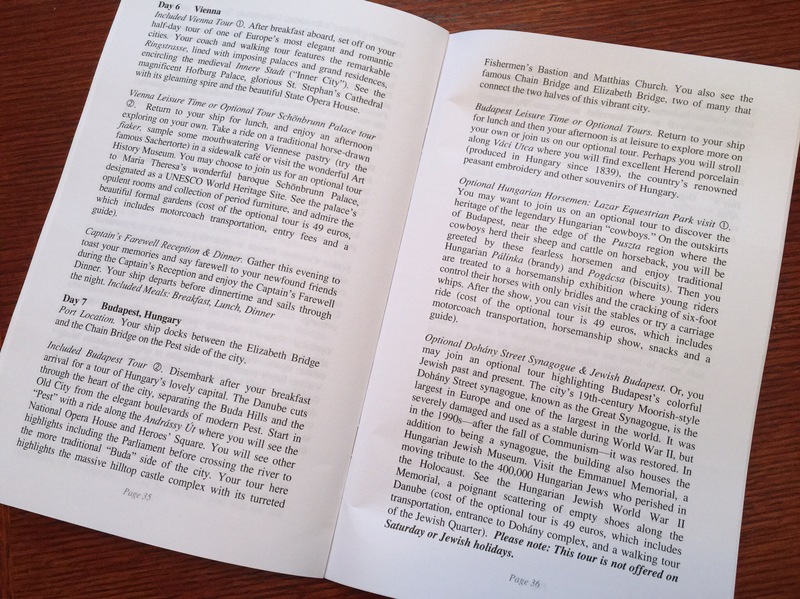 I’m happy to share answers to questions found in our itinerary booklet. Got a question? Write it in the comments or email me at val110358@aol.com Much more cruise info to come! Have you taken one of the optional excursions? I’d love your recommendations! When do we put the paper luggage tags on? Hi Judy!! You wouldn’t need to put the paper tags on until you have your bags and head to the ship. We are heading out on a Russian River cruise with a different company in August and I found some neat plastic sleeves with a wire hook that are supposed to stay attached to bags even in high wind! I’ve got a set on order from Amazon. They have different sizes for different cruise companies. Just be sure you search for the ones that accommodate Viking’s paper tags. I don’t mind paying a little for extra security. Thanks for the question! Be sure to ask if you have any more. It’s difficult to say with just a love it or just OK. It totally depends if you are happy with their prices and what you get for that price. We have done other river crises and they were very comparable and a much lower cost. Same itineraries and both boats docked side by side. The money I saved was enough to add a couple extra weeks to our vacation. Those experiences were worth more than fancy food.